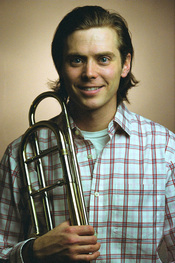 Grant Randall teaches trombone, trumpet, other brass instruments, and piano at the Center. He holds degrees in performance from the New England Conservatory of Music in Boston and St. Olaf College in Northfield, Minnesota. Grant got his first teaching job in middle school and has been working as an educator ever since. He has taught trombone, trumpet, lower brass, piano, and academic music classes for the Community Music Center of Boston, Marrowstone Music Festival, Brookline Schools, Longy School, and the Dedham School of Music, in addition to the John Payne Music Center. He began teaching at South Shore Conservatory in 2011. Grant also teaches trumpet, euphonium, tuba, and piano students just as frequently as trombone. He began studying music on piano in childhood, enjoyed lessons with renowned soloists and jazz musicians alike, and continues to perform on piano now. As is often repeated by musicians the world over, at some point the musician plays all the instruments. A resistant student is more a challenge to the teacher’s creativity than a problem. Let’s work on this challenge together. Art music is fun but it is important to remember that it is built of the music we all know. Everyday, I take this thought to my horn. My first love is ensemble music because I love living in the middle of beautiful harmonies. I vividly remember the first rehearsal I had in an orchestra: the first notes the string section played were like a light switching on in my ears. Growing up, I was fortunate to play and tour all over America, Europe, and Scandinavia. Sound and the people who make it was it. Having been schooled by the rich history of Jazz in Boston and New York, I learned its sonorous colors. First in timbre and then in melody and rhythm, I still slowly chip away at this other great American tradition. When I got my first job as swim instructor my grandmother told me teaching was the only thing she knew I was good at. True today as it was then, I am happy when I unlock the natural energy of a student with progressive successes. This is not a musical goal: my teaching is first about developing the person using the objective mirror of music. Growing up, I found my worst moments came when fear of failure eclipsed lessons the humanities had taught me; I find much in the world beyond music to inform my teaching of each student’s unique intellect. I teach the brass tacks of controlling the emotive sound of a brass instrument because I myself have found no greater reward in music. I’ve spent years studying so I can pass on skills from which I’ve drawn so much inspiration. Horns are the new black and I will show you how they work. Grant's principal performance instrument is trombone. He enjoys playing and teaching classical music, jazz, and the avant garde. Grant has performed with the Boston Philharmonic, New Bedford Symphony Orchestra, Masterworks Chorale Orchestra, Symphony-by-the-Sea, Boston Early Music Festival, and many other ensembles and theater companies in New England. He is an award winning soloist. He also serves as tenor vocal soloist at St. Stephen’s Episcopal Church, Providence, RI. As an improviser and bass trombonist, he plays with the Berklee Faculty Jazz Composers Ensemble, Omar Thomas Large Ensemble, the Beantown Swing Orchestra, Fat City Blues Band, Hot Tamales Brass Band, and many other creative bands. He especially enjoys avant garde music having performed music by Frank Martin, Helmut Lachenmann, Aaron Jay Kernis, Ingraham Marshall, Fisher Tull, Stockhausen, and Davide Ianni as a soloist. Grant is a year round outdoorsman, avid reader, and record collector. He is originally from Seattle, WA and currently resides with his wife and son in Jamaica Plain, Boston. Call 617-277-3438 now (or email info@jpmc.us) to schedule a lesson with Grant! No registration fees.